There has been a dearth of public polls on Amendment 66, a sure sign that the proponents who have already raised $3 million are not interested in providing any of their internal polling for public consumption. The only poll released came from the opposition. 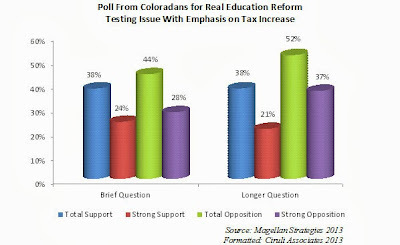 It shows that when the ballot-type questions offered the voter emphasis the tax, the proposition loses. That is not big news, but does indicate that the proponents are going to need their multi-million dollar persuasive campaign. If the issue is mostly framed as a tax increase, it will lose. As of today, with no information provided as to what the proposal accomplishes or who supports it, Amendment 66 loses by about four percentage points when comparing strongest opposition with strongest support (28% oppose to 24% support). If the dominate frame of the election is the income tax rate increase, by this poll, it would lose by at least 14 points. Needless to say, the proponents will want to change the frame. They will also want to shift the demographics of the vote. This survey had 39 percent Republicans and 34 percent Democrats – in the pollster’s view, an accurate snapshot of the 2013 electorate. Republican total opposition was 68 percent and Democrat total support 63 percent. Needless to say, proponents will want more Democrats and younger voters (55% support) and Hispanics (53% support). Hence, increasing their support level and their participation rate would improve the initiative’s chances. The group most in play are independents, who oppose the initiative in this initial test 35 percent to 44 percent, with a fifth undecided (21%) – good for opponents, but still a group that proponents could win (they would need 70% of undecided independents). Republicans Dominate Colorado’s Congressional Delegation. Will it Change in 2014? Republicans hold four of Colorado’s seven congressional seats, and the great battle in 2014 will be for Congressman Mike Coffman’s 6th congressional seat, which he barely held in 2012, a strong Democratic year. Although all politics is local, U.S. congressional races are strongly influenced by the tides that are affecting national politics. 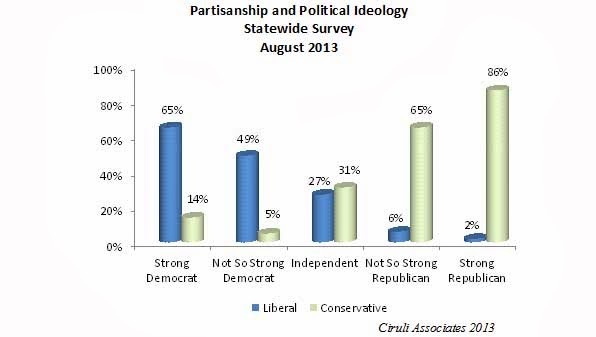 The signs are mixed for partisan advantage in 2014. Democrats have been hopeful to regain the 16 seats they need to retake the House and Colorado’s 6th CD is one of the seats they have targeted. But President Obama’s weak approval numbers and a series of failed and controversial initiatives make 2014, at best, a wash. The President’s national approval rating is barely holding onto 44 percent, under water by 6 points. His latest statewide approval was 41 percent (Quinnipiac, August 2013). ObamaCare, which will be in the news the next several months due to its October 1 implementation date and the Republicans’ effort to defund it, is not popular with many voters, including many who will vote in the 2014 midterm election. Historically, in the president’s last midterm election the incumbent’s party loses House seats. The election will attract fewer voters than a presidential election year. In Colorado, typically 700,000 fewer voters will show up. Colorado voters appear to be in protest mood. They just pushed two Democratic leaders out of office, leaving Democrats on the defensive. 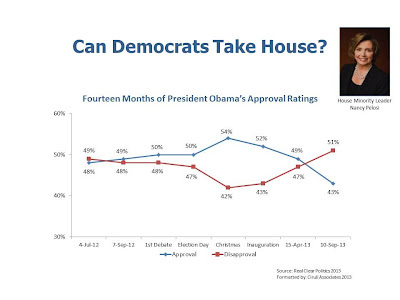 Coffman’s re-election chances have improved as Democrats have stumbled. Angela Giron was recalled because a third of Pueblo Democrats supported it. A PPP poll conducted, but not published prior to the election, had Giron losing by 12 points (poll 54% to 42%; final results 56% to 44%). She carried none of the constituencies Democrats are supposed to be ascendant with. She lost women, Hispanics, the young, independents and a third of Democrats. The survey had 48 percent of the sample Democrats near the registration number (46%) and 35 percent Hispanic. Specific gun control legislation, which motivated the initial petition effort, was either popular, such as background checks (68% support), or tied in support and opposition, such as magazine limits (47% support each). Other explanations for the overwhelming defeat of the Democratic incumbent are local factors, such as Giron’s specific political history (appointed, no real contests in career) (see “Giron Could Lose” blog of July 31, 2013). But a couple more general factors also appear to be significant. First, the Democratic brand in Colorado has been damaged and is on the defensive. Governor Hickenlooper’s approval rating in the Democratic Senate district was only 39 percent, 8 points below his most recent statewide measurement of 47 percent, which is a mediocre rating. A second factor is that Pueblo has a larger compliment of more traditional Democrats than other areas of the state. Pueblo Democrats have a more blue dog coloration and are both socially more traditional and fiscally more conservative. Liberal social and fiscal statewide ballot measures often lose in Pueblo County. Finally and related was Ms. Giron and the state’s Democratic legislative leadership taking an aggressive liberal position in their hurry-up procedures and agenda in the 2013 session. The narrative that dogged Ms. Giron and the leadership from sine die was pushback on that agenda shown in weak statewide polls, these two recalls elections and a rural succession movement. The one billion-dollar school funding measure will be a challenge to pass, but one of its major barriers, the reputation of Denver Public Schools, has been significantly repaired in recent years by the combined efforts of the school reform movement, made up of the liberal wing of the local Democratic Party and many minority and business community leaders. School board positions have been repeatedly won by DPS supporters who are not afraid to say yes to changes that organized labor oppose. The election campaigns over several cycles have been hard fought and expensive. Although the positions are not compensated, hundreds of thousands of dollars have been spent to elect reformers. By electing a reform majority, DPS has become a national model for effective and consistent political action. Barbara O’Brien, the former Lt. Governor, is a DPS board candidate and is receiving the support of much of the city’s Democratic Party and the progressive business community. She will easily win. Although the one billion-dollar school tax increase will likely pass in Denver, it must be justified to local voters who gave DPS millions in new tax override and bond revenue in 2012. But, the campaign is greatly aided by credible advocates, such as Ms. O’Brien. Both Colorado political parties are dominated by their most ideologically intense members, producing the dramatic legislative swings from the Republican House in 2012 to the Democratic House in 2013. Member beliefs, their aggressive floor and committee procedures, and starkly different outcomes highlight that Colorado’s legislature is intensely partisan and ideologically polarized. It has become more like Washington. The polarization is reflected in the public. Voters claiming to be strong Democrats and strong Republicans identify most firmly with liberal and conservative political philosophies, respectively. Two-thirds (65%) of strong Democrats claim to be liberals and most strong Republicans (86%) align with a conservative self-description. The Democrats’ problem, which was highlighted by the Pueblo recall, is that upwards of a third of registered Democrats are not aligned with their intensely liberal legislative leadership. Democrats effectively used the slogan in the early 2000s that Republicans were only interested in guns, God and gays while the economy languished and problems piled up. Today, are Democrats vulnerable to a similar charge; that is, are they mostly focused on guns, gays and more government? 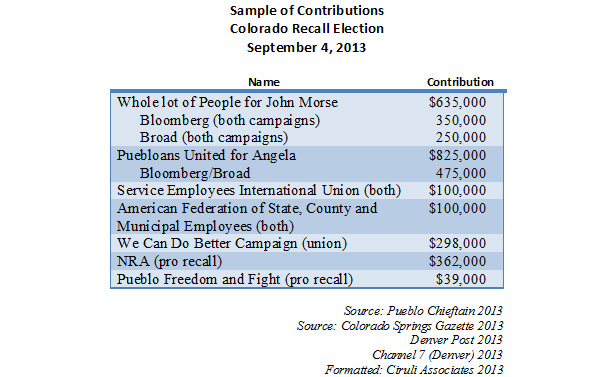 The September 11 recall was the most recent demonstration of the nationalization of Colorado politics. Along with growing polarization and the aggressive tactics of using the recall to take rapid action against an opponent, millions of dollars of campaign contributions flowed in mostly from out-of-state with professional TV and radio commercials and presidential-like GOTV campaign techniques. 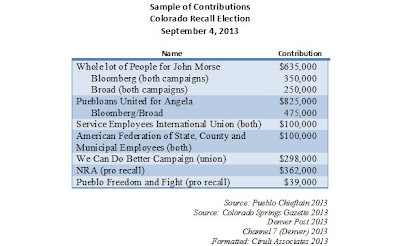 Three million dollars could not stop the recall of two Colorado senior democratic leaders. “Political analyst Floyd Ciruli said Democrats seem to have been upset about what they saw as government overreach not just on guns but on other parts of the Democratic agenda. Polling showed individual gun laws, such as limiting ammunition magazines to 15 rounds, had some support, but the size and speed of the gun package and other Democratic bills may contributed to the senators’ fate, he said. About 40 percent of voters turned out in Pueblo, an impressive figure given that there were no mail ballots. Ciruli says it’s unheard of to have millions of dollars flowing into a state senate race. The financial advantage may be why, despite the demographics of his district, State Senator John Morse is so confident he’ll defeat his GOP challenger, Bernie Herpin. ‘They see me as vulnerable. Me? Not so much,’ Morse said. “Denver independent pollster Floyd Ciruli agreed. ‘There was a sense that people were not being listened to and felt shut out from the aggressive agenda put forward by Democrats in the legislature,’ he said, noting that an 8-to-1 spending advantage by recall opponents failed to stave off defeat. The Limits of Tragedy. Gun control is fiercely divisive and not a settled topic. In low turnout elections, tragedy loses its potency. The Big Gulp Factor. Mayor Michael Bloomberg was a net liability. His money was countered by his low favorability. Beware of Polling. Support for gun control tends to subside as time passes. Plus, if it becomes a “rights” issue, support weakens. The Intensity Gap. Gun rights advocates are often single issue voters and will turn out in a September election. Lynn Bartels with Kurtis Lee assessed the impact of the recalls on Colorado politics and assessed it went well beyond the Democrats’ loss of two state senate seats and gun legislation. “That, Ciruli said, would benefit Hickenlooper [a narrow Democratic majority in State Senate with possible Democratic defections]. In the governor’s first two years in office, Republicans controlled the House and Democrats the Senate, meaning little controversial legislation landed on his deck. But Democrats scored stunning victories in 2012 and Ciruli thinks that emboldened them to push for an ‘aggressive agenda’ during the 2013, whether it was gun bills, a renewable energy measure that many in rural Colorado opposed and a complicated elections bill that critics said rushed through the process. Nancy Pelosi recently launched a twitter when she appeared to say she didn’t aspire to be speaker again. Was this admitting Democrats are unlikely to pick up 16 seats to win the House in 2014 or was she ready to go home regardless of the outcome? Pelosi immediately clarified that she was only saying her personal ambition is not the issue, rather success for the Democratic majority. 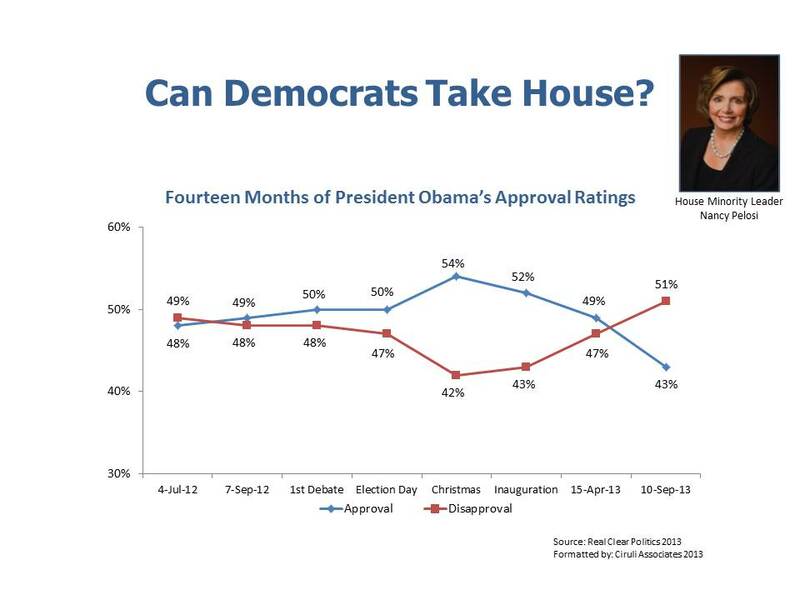 President Obama’s fading public support makes winning the House even less likely than history would suggest. But, presidential approval is volatile. If Syria turns out well for him, there could be a “rally effect.” If it goes south, he could lose five points in a very short time. This blog correctly predicted Democrats would not win back the House in 2012 after their loss in 2010, but has been repeatedly wrong predicting that Pelosi would give up leadership. She retained it in 2011 and 2013. Her caucus, which is overwhelmingly liberal, loves her and, as she just demonstrated, she will raise funds for her team, like Mr. Romanoff in the contested 6th CD. Democratic billionaires are providing a major part of the money fueling embattled incumbent State Senators John Morse’s and Angela Giron’s campaigns. Recent contribution reports show more than $500,000 has been collected from pro-gun control New York Mayor Michael Bloomberg and billionaire Los Angeles civic activist Eli Broad. They recognize a loss will have major repercussions in Colorado for the Democrats’ dominance in a swing state and nationally for the gun control movement. The total reported is now more than $3.5 million for both races. Giron’s Pueblo opponents declared $24,000 and another outside player, the NRA, reported contributions totaling $362,000. Identifiable amounts near the end of the campaign from media reports are $3 million for anti-recall and $400,000 for pro recall forces. Television and radio advertising, mostly for the Democrats, is near saturation. The mail and phoning has been ongoing, along with the hundreds of volunteer walkers. Environmental, labor and women groups are coming in from the Denver metro area and beyond. Democrats, their liberal allies and gun control forces are all in attempting to save the two Democratic senators on Election Day – September 10. National and international media has been providing extensive coverage due to the local and national consequences. Predictions in what is expected to be a low turnout race are difficult. Although the Democratic incumbents have an advantage in resources and the public’s dislike of recalls, the anti-gun control forces have a passionate grassroots base and a supportive narrative of Democratic legislative overreach. Colorado politics is polarized and in close balance. One year after a huge victory with President Obama leading the ticket in 2012, polls show Democrat and Republican partisans are now closely matched, with independents divided in their preferences. Governor Hickenlooper struggles to gain traction in his re-election. The latest Quinnipiac poll has a potential race between Hickenlooper and former Congressman Tom Tancredo within a one-point difference – 46 percent to 45 percent, with independent voters tied at 43 percent each. 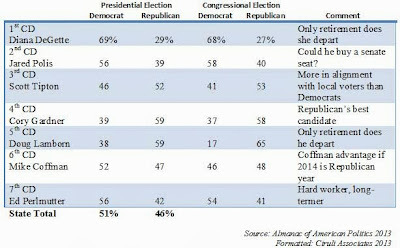 In fact, a plurality of voters did not believe he “deserves to be re-elected” (48% not deserve to 45% deserve). Hillary Clinton, the near presumptive presidential nominee for the Democrats, loses to Governor Chris Christie in the second Quinnipiac poll this year after Obama won Colorado by 5 points in 2012 and 9 in 2008. The Colorado legislature and its leadership, Senate President John Morse, embroiled in a recall, and Mark Ferrandino, Speaker of the House, gave the Democratic Party a strong left image. It united most Democrats, but drove off most Republicans, including moderates. Due to the legislature’s actions, the news this summer is all about Democrats and Governor Hickenlooper on the defensive. Sept. 10 recall of Morse and Senator Angela Giron, a revolt of about a dozen or so rural counties due to Democratic legislation and a massive school tax increase, are reinforcing the Democrats’ tilt left. Obama and Democrats have dominated Colorado politics for most of a decade, not by the state moving dramatically to the left, but because their candidates’ resumes had moderate images and they had superior campaign techniques. They could still win in 2014 with their campaigns, but, as of today, their moderate image is gone. The Democrat brand, which is dominated by President Obama, is no longer helping in Colorado. Like President Bush’s weak numbers before the 2006 mid-term, Obama’s lower numbers hurt more than help and his approval in Colorado is below his national average. Hence, what is being offered Colorado voters today is two parties dominated by their extremes. Speaker Ferrandino represents the very liberal Democrats, and Tom Tancredo, frontrunner for governor, represents the conservative Republicans. Ferrandino vs. Tancredo is a polarizing choice and, as of today, a very close call. Although conventional wisdom says John Hickenlooper can’t be beat by the current Republican field, he is vulnerable, and if the Republican Party had a viable candidate, he could be in a tough race. Quinnipiac assembled their latest polls for nine governors up for re-election. Hickenlooper is in the middle of the pack for approval among all voters, but below 50 percent. He is a bit lower than midway with independent voters and is near the very bottom in approval from Colorado Republican partisans. This represents a major reversal for Hickenlooper from his popularity as mayor of Denver and his first two years as governor when he was seen as a moderate, highly approved by independents and liked by large numbers of Republicans. A Republican that could unite their party and appeal to disaffected independents could beat Hickenlooper. With the headline, “The swing state at the frontier of social change,” the latest Economist describes the polarization of Colorado’s current political season and the blowback that has put Democrats on the defensive this off-year. They have wasted no time. This year’s legislative session, says Floyd Ciruli, a Denver-based pollster, was one of the most left-wing he has ever seen. Along with the new gun laws Democratic leaders pushed bills to allow gay civil unions, require more use of renewable energy, lower tuition fees for illegal immigrants, allow voters to register on polling day and abolish the death penalty. All but the last were signed into law by Governor John Hickenlooper. Lawmakers also grappled with rules for the sale of marijuana, legalised by voters last year, and debated an income-tax rise to fund education, which is likely to be on the ballot in November. Ideas for more new taxes are lined up “like planes on tarmac”, says Mr. Ciruli.